DADaPalooza: REVIEW: Fringing on Theatre- 3 shows in 1 night! 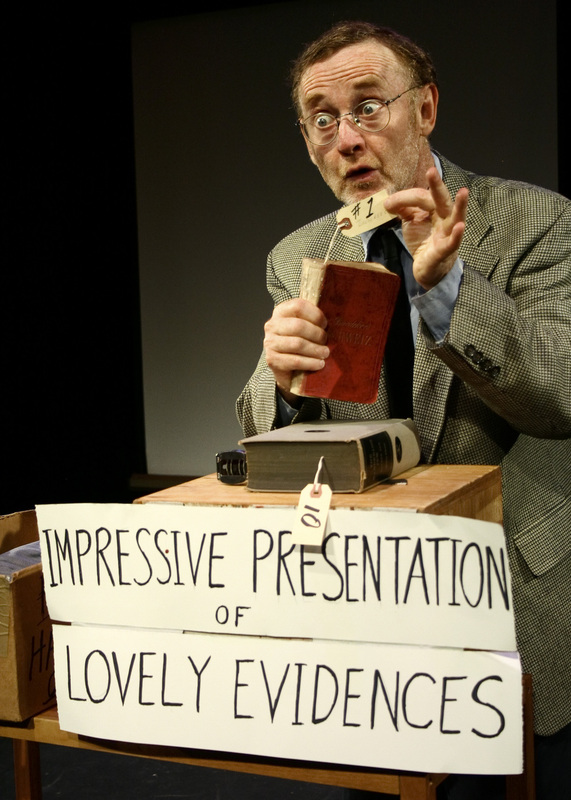 REVIEW: Fringing on Theatre- 3 shows in 1 night! As I mentioned in my preview of the Chicago Fringe, the best way to Fringe is to see a lot of shows. I did just that on the first day and saw 3 shows, all at the same venue. Here are my reviews of the shows I've seen so far. I'm going out of town for Labor Day, so am coming back next week, and my plan is to see 7 or 8 more shows as I can. I'll try to review them all, both because I want to support the Fringe concept and because it's important for artists to get reviews of their work. 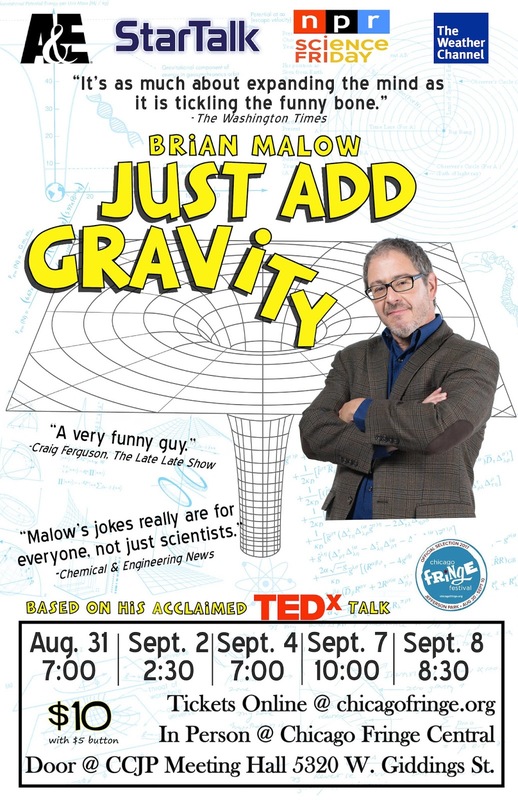 The first show I saw was Brian Malow's Just Add Gravity. Brian hails from North Carolina by way of Texas, and bills himself as "The Science Comedian." I have to admit that I came into the show with a false notion. 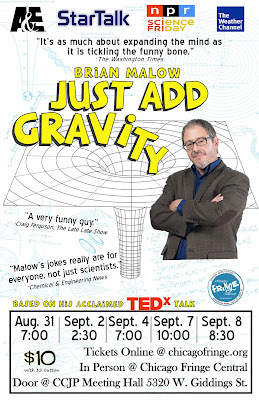 Between the word Gravity in the title and the billing science comedian, I immediately assumed he was a juggler. Word to the wise: Brian is not a juggler! He made some great observations about the sun and about gravity. (The sun, by the way, a medium sized star at best, is 1,000,000 times larger than the size of the earth, which is mind-bogglingly huge. ) And that the sun's energy encompasses everything. Your poop is sunshine, your voice is sunshine, everything in the world is there because of sunshine! And gravity, according to Malow, is an attractive force that keeps us all together. He also mentions birds and dinosaurs, and how on some level, Thanksgiving is an ode to eating dinosaurs. Some great and pertinent and comic observations. He also did a little banter with the audience (there happened to be a retired organic chemist in the audience and a music teacher, and they both asked some questions during the Question and answer period. ) After the show, he and an audience member started geeking out about stereo photography on Instagram. Brian walks the walk and talks the talk. The jokes in the show mostly hit their marks, and Brian has a likable persona. As he admits during the show, the show is not quite ready for prime time, but he is. He had a music stand ready with notes about the show, and went into the bits, but occasionally lost his place, or missed the smooth transition into the next thing. He's got five shows at the Fringe, and this was the first, and I'm guessing by #5 his show will be really smooth. But go see him before that! It will be worth your time! Underneath the Lintel is a play written by Glen Berger. 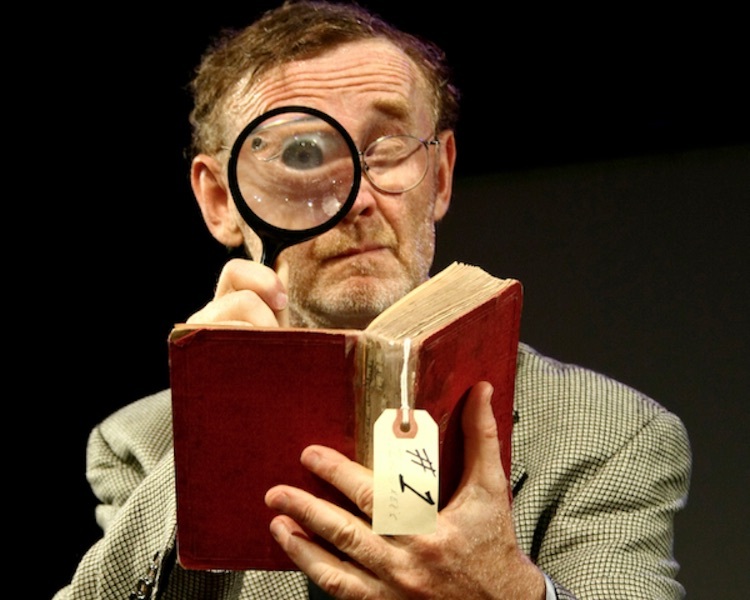 It's a tragicomedy about a dogged and OCD Librarian from somewhere in Holland who discovers a 123 year old overdue book and then risks his staid life to go out and follow the ensuing clues to solve this mystery. Along the way we visit London, China, Germany, the United States, and a few other places with our fussy librarian, and learn a bit about his life, and the missed opportunities he's had. Other things that figure strongly into the story are a dog named Zebrina, some very rotten clothes, true love, and the myth of the Wandering Jew. The show is brilliantly acted by Pat O'Brien, a seasoned film and television actor with over 22 years of movie and television experience. (He was Mr. Dewey on Saved By the Bell) Pat moved 6 years ago to Minneapolis, and has been working in lots of theatrical shows since. He's a marvelous character actor, and brings us along with him every step of the way. There's also some really profound moments of theatre during the show. The set is simple, and uses slides as a way to set the mood, and show us the world beyond, but because the lighting of the show is minimal at best, they are difficult to see. He has other props that he uses to MUCH better effect. If it were up to me, I'd cut the slides (which don't add much) and continue to add pieces of "lovely evidences" as the character calls them to solve the mounting mystery. The play was originally scheduled to be performed on September 18, 2001 in New York, at the SoHo playhouse, but the events of September 11 made that rather difficult. It did get a performance a day later on the 19nth. The script has a lot in it and has an interesting if eccentric story arc. I don't think the script 100% hung together, but the acting in the show made it work. Pat's been touring this show for the last 5 years or so, and has won numerous Best of Fringe awards in various other fringes, and I think all of that hangs on the impressive character acting of Pat. This show was the least attended of the shows, with about 15-20 people in the audience. He asked specifically for audience members not to reveal what went on during the show, to preserve the "mystery", and so I will honor that request. I will say that like a lot of mentalist acts that I've seen, he seems to know stuff that shouldn't be possible for him to know. Stuff that is not google-able. I've seen other mentalists do many similar tricks, but (as he should) Mark does each of these tricks with his own style. More than one person was left amazed as he consistently was able to read his or her mind. How does he do it? I have an inkling, but I'm not telling. Is he making educated guesses? Does he have a confederate? Is it really magic? Does he have extra sensory powers? I am sure that the latter is not true, but the others, well, that's the mystery. You will have to see the show for yourself to decide. The show is fun and engaging. In addition to the tricks, Mark is funny and he puts the show in context with several personal stories. 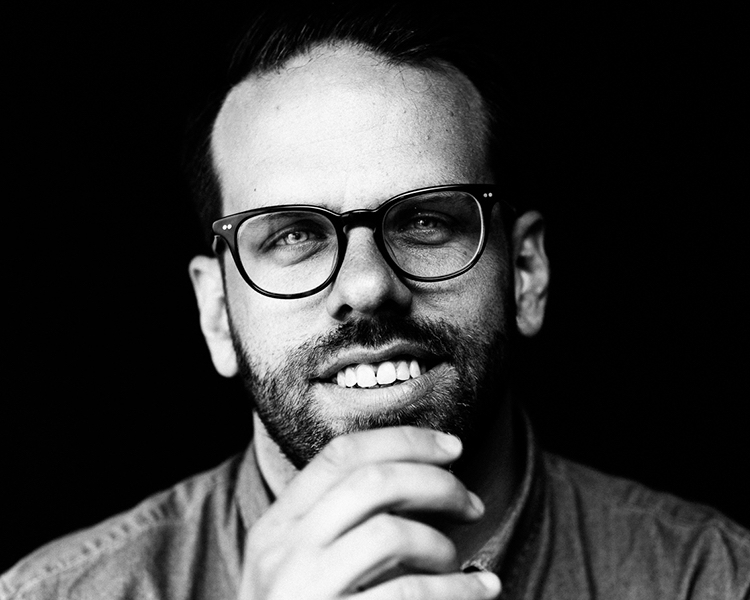 His show has had a number of sold out shows at the Orlando Fringe and the Frigid Festival in New York, and is polished, and well worth seeing. After the show I hung out at the designated late night bar. The Windsor Tavern (4530 N. Milwaukee). There was a small but friendly Fringe contingent. There I met the chief trustee of the church which houses two of the five venues for this year's fringe, the executive director of the festival, and a couple of performers, including Mark and his friend Justin, another magician who isn't in the Fringe this year. Beers were drunk, stories were told, friendships were made. This is what the Fringe is all about! Would love to hear your stories and reviews of the Chicago Fringe. Please post links or reviews in the comments!